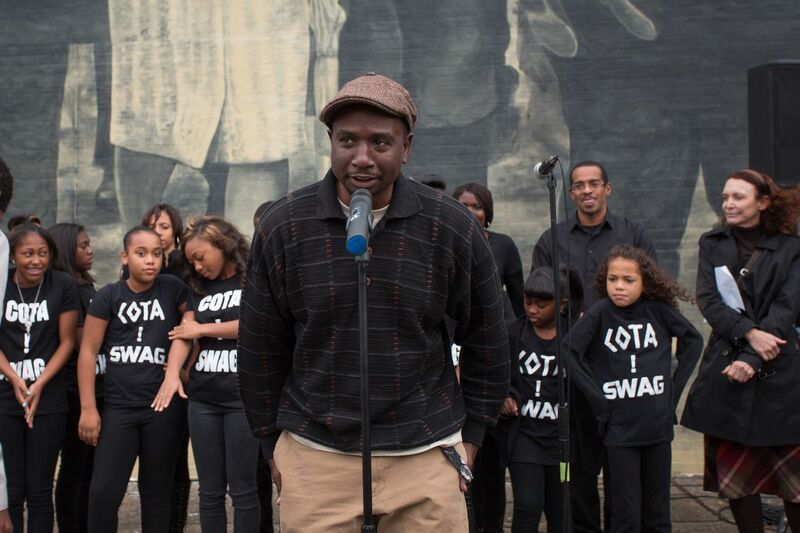 Willis 'Nomo' Humphrey speaking at the mural dedication for 'Staircases and Mountaintops: Ascending Beyond the Dream,' one of his works, in 2014. Friends and colleagues of the late artist Willis ‘Nomo’ Humphrey are organizing a benefit in his memory. Humphrey, who died suddenly in late November at the age of 44, was a beloved and respected muralist, known for his masterful portraits of black legends. His colleagues from Amber Art and Design, the North Philadelphia firm that Humphrey cofounded, will mount an exhibit and silent auction to raise funds for Humphrey’s three teens. “He was such a talented and humble man,” said Keir Johnston, of Amber Art and Design. The deceased painter’s murals, like the Octavius Catto mural that he worked on with Johnston, showed Humphrey’s dedication to black history, but also his meticulous approach. At the time of Humphrey’s death, Johnston said, Humphrey was still challenging himself, still growing as an artist. “We want to continue to honor him and his legacy,” Johnston said. 'Remembering a Forgotten Hero,' a 2018 mural depicting Octavius Catto. The exhibition and auction will run from Fri., March 1 to Sat., March 2 at Crane Arts in Kensington. Organizers are still accepting donations, but Johnston said roughly 25 artists have signed on so far. Prices will range from $50 to $1000, Johnston said, with hopes of giving visitors the chance to score art at reasonable rates. Johnston expects that some 100 pieces, all the work of local artists, will be on display and up for auction. The event will include live art, music, poetry, and should count contributions from the different artist communities where Humphrey had an influence. “I think it’s going to be a reflection of his impact,” said Johnston.